Far back in the Santa Barbara Mountains, California, is a snug little mountain camping ground called San Marcos Cold Spring. Above the welcome watering trough useful alike to man and beast, is a small wooden box nailed to a tree. On it is written "Wanderers' Library". A seat by the side tempts the weary wayfarer to pause and let his horse rest and drink whilst he dismounts and sits down to enjoy the lunch he invariably carries for the long ride. After taking a drink from the cold spring using the bright tin cup provided, he can enjoy a feed for his mind till the horse is ready for a few more mountain miles. 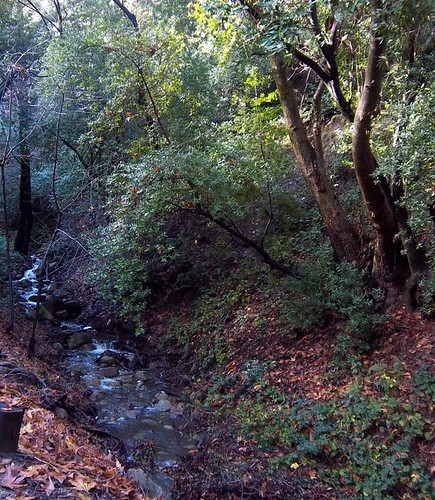 There are dozens and dozens of natural cold water springs in the vicinity of "San Marcos Cold Springs", in the mountains above the City of Santa Barbara. 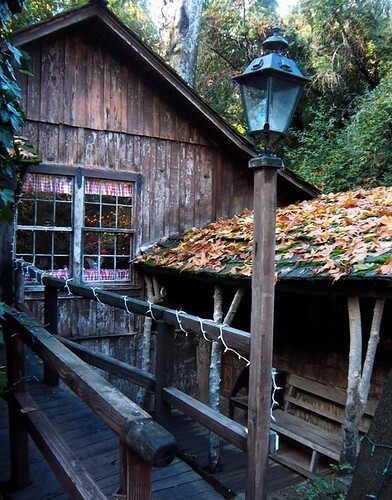 Although I have never seen any evidence of the charming "Wanderers' Library", described above, I can direct you to another treasure located there: the Cold Spring Tavern. 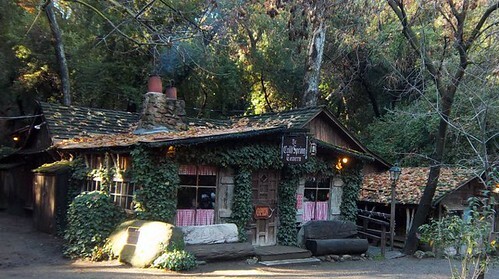 The Tavern, located just off the San Marcos Pass, is surrounded by tall, sinuous trees, mossy paths, and sandstone boulders; it seems there is always a mountain breeze to ruffle the chimney smoke in the afternoon. At once, you will feel that you are in an ancient place, a place where history seems to collect and merge into the present. 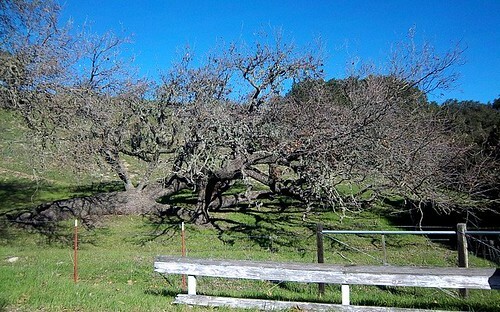 Although San Marcos Pass is now a scenic and very modern highway, it was, for thousands of years, a footpath originally created by the Chumash, Santa Barbara County's indiginous people. Near the summit of the pass, and scattered through the vast landscape, are sites deemed as holy by the Chumash. Painted Cave, a California State Park site located at the top of the San Marcos Pass, is one example. In 1846, Col John C Fremont led hundreds of men across the storm-shrouded San Marcos Pass on a mission for the United States of America - to take Southern California from the Mexican government, who had possession of it. They arrived safely in Santa Barbara on Christmas Day of that year. A treaty was signed on January 5, 1847, making California an independent republic. California joined the United States in 1850, and with the westward expansion of the United States, came stagecoach travel. 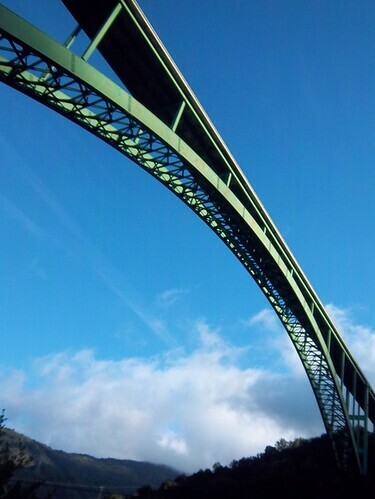 The Pass was recognized as a very useful route in transporting travelers from the coast to the valley. In 1868, local Chinese laborers built the San Marcos toll road to accommodate the stagecoach travelers who rode between Santa Barbara and the Santa Ynez Valley. It was at that time that the first buildings on the Tavern site were erected. Stage travel was a trecherous, rugged, ardous business. The conveyance used locally was called a "mudwagon". There was no glamour implicit or implied. The roads were either slick with mud, the way clouded by fog and rain, or it full of dust and heat in the summer months. Robbers and banditos were all too real - and frequently the stagecoach journey was interrupted by armed bandits. 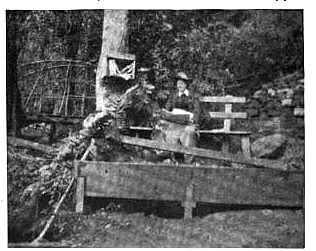 Stage drivers and their horses, as well as the passengers, were delighted to catch view of the little mountain retreat - the tavern that is nestled back into the mountainside, next to the creek. It was a place of respite and comfort, a moment of ease before the journey north to the Valley, or south, to the coastline was resumed. Eventually, the stagecoach era passed, and horses were replaced by horsepower. 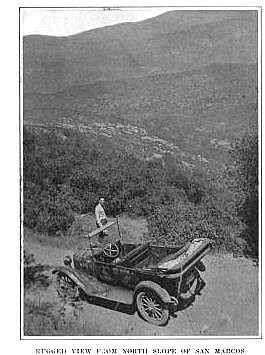 With the coming of the automobile, California was discovered to be the ideal place for pleasure drives. The scenery of Southern California, and the consistently beautiful weather created opportunities for day-long events, perfect for the tourists who began to flood into Santa Barbara County for vacation and leisure. On a clear day there is no mountain trip in Southern California to give more sheer delight than a ride over San Marcos. Turning and twisting up the steep south wall of the range, the road rises so fast and the valley and ocean fall so sheer below, that it is almost akin to airplaning. Hundreds of motorists from Los Angeles and vicinity now seek Santa Barbara as an ideal place for a week-end outing, and hotel accommodations in Santa Barbara late on Saturday evenings are difficult to find as a rule. When it is possible for the motorists of San Francisco and vicinity to tour down over splendid roads all the way, Santa Barbara folks realize that they will get the benefit of a doubled travel. And, with El Camino Real complete from end to end, the winter motor travel up and down its length is going to be a factor of importance that it is hard to estimate. Time has marched forward, and San Marcos Pass is now a busy highway used by commuters, tourists, trucks, and anyone wishing to utilize the quickest route between Santa Barbara and the Santa Ynez Valley. The Cold Spring Tavern is located on Stagecoach Road, below the San Marcos Pass. Stagecoach Road is narrow, shoulderless, and it scissors back and forth below the sandstone peaks and lacy trees that hover over the road. The primitive road serves to transport you back in time, slowly, as you wind lower and lower into the little valley. From the busy highway above, it seems that bits of history and time mingle and float down together, settling here in this little, secluded, shady nook. They dust the air with magic. 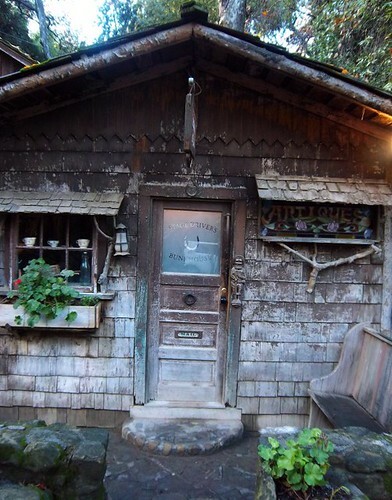 The location, and the Tavern, are charming, rustic, romantic, and beautiful. The windows of the Tavern always seem to cast a golden glow. In the winter, the little creek rushes over tumbled sandstone boulders, where in summer, only shadows play. 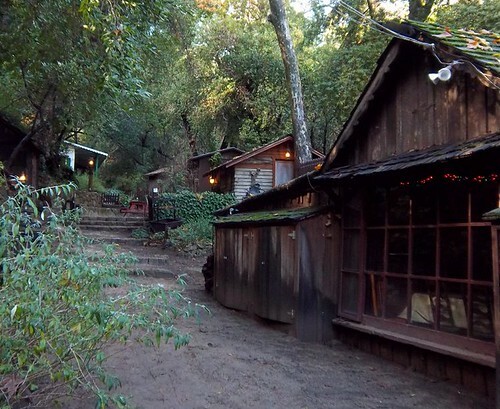 Every Sunday, hundreds of people descend on the little log enclave, enjoying live music, cold beer, and barbequed tri-tip. On winter days and evenings, you may have much of the Tavern to yourself as fewer people venture here in the cooler weather. The restaurant serves breakfast, lunch, and dinner. In addition to traditional fare, the tavern also offers more exotic options - such as buffalo steak, venison, duck, rabbit - and Wild Game Black Bean Chili. If you want to leave the present behind and dip into an earlier time - for just an afternoon or evening - drive up San Marcos Pass, and pull off the modern highway at Stagecoach Road. Once you leave the highway, you begin the trip into the little valley of history and romance. 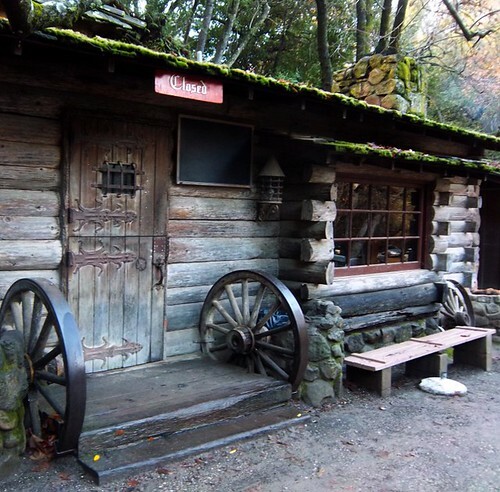 It seems that not much changes at the Cold Spring Tavern. And that is exactly how we like it. 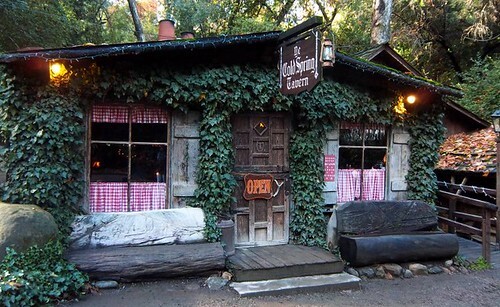 Visit the Cold Spring Tavern website - sign up for their newsletter, check the music schedule (they have live bands this New Year's weekend), and peruse the menu, and plan your trip to Cold Spring Tavern. 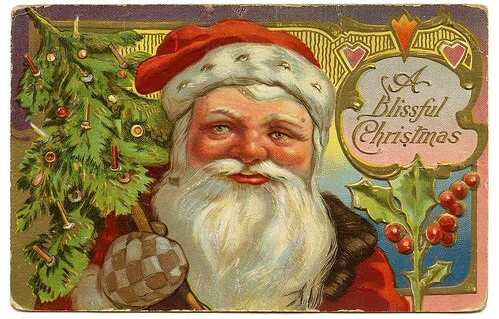 Cartas - Santa Barbara Advent Calendar - December 25, 2010 - A Very Merry Christmas!